Refill Friction Stir Spot Welding (Refill FSSW) is a process of bonding two plates in an overlapping configuration as would be done with conventional resistance spot weld. The process however is vastly different. Refill FSSW is a variation of Friction Stir Welding technology, a solid state process that is ideal for joining aluminum components. Typical applications include aircraft fuselages and automotive body panels. A non-rotating collar (clamping ring) contacts the upper material and applies a downward force, effectively clamping the two pieces of material together. This collar also contains the material flow throughout the process. 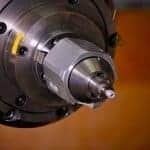 Once the clamping ring has made contact with the part, a rotating shoulder and probe contact the part, generating heat through friction. The heat warms the workpiece material until the material reaches the plastic state. 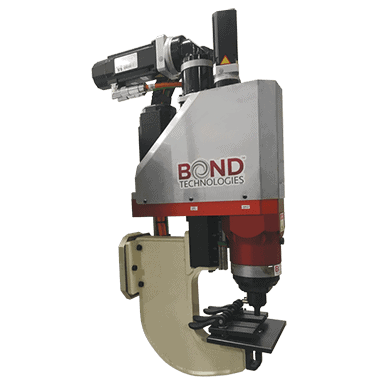 The probe then retracts while the rotating shoulder plunges into the first layer of material. The retracting probe allows an area for displaced material to flow. The plunge continues until the depth is sufficient for a bond between the upper and lower materials. The probe and shoulder then reverse directions, moving to their starting position or point of initial part contact. During this stage of the process, the probe is forcing material back into the cavity formed by the retracting shoulder. The interface between the plates is bonded by the rotational motion under heat and pressure, creating a strong weld between the two layers. Upon process completion, the weld area is nearly flush to the surface, showing little evidence that anything has occurred. Find out if our REFILL FSSW machines OFFER the right solution for your production needs.